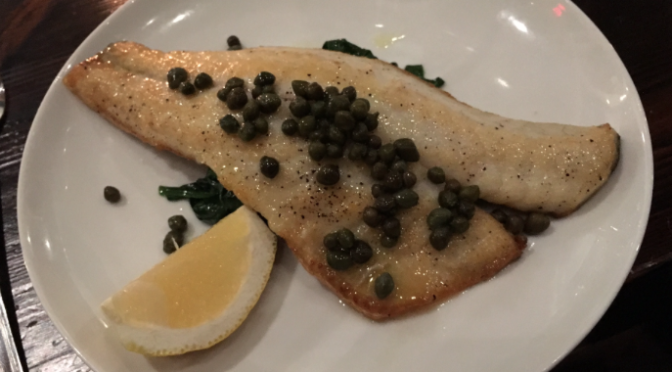 Branzino with capers and lemon at Vento Bistro. 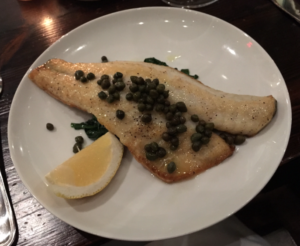 Putting ourselves in the chef’s hands, we started with plates of olives, then moved on to terrific braised artichoke hearts, followed by a hearty pasta bolognese, and then a main course of branzino with capers and lemon. For dessert, we shared fresh berries with whipped cream and tartufo. All delicious. In fact, I would have happily (and piggishly) added another course or two. Vento’s space is small, warm, and intimate with an open kitchen adjoining the dining area. Perfect for a date night. And the adjoining wine shop ensures that meals are properly lubricated. Here’s Vento’s Facebook page. Highly recommended.